Fig. 1: White Figured Jaconet Victorian Garden Hat. To make this hat cut of double stiff lace for the crown an oval piece ten inches long and eight inches and seven-eighths wide. Lay this piece in small pleats on the outer edge, at regular intervals, until it is wide enough to fit the head (twenty inches and a half in the original). cover the crown with figured jaconet, which is arranged in several cross pleats for the middle of the crown. 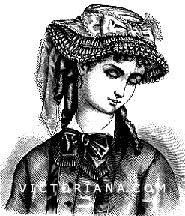 For the rim of the hat cut a straight strip of figured jaconet fifty-two inches long and five inches and three-quarters wide, and gather this strip, sewing in a piece of covered wire forty-four inches long on one side, a piece of similar wire thirty-one inches and a quarter long through the middle, and a piece of wire twenty inches and seven-eighths long on the other side. The ends of each piece of wire are overlapped half an inch and fastened, and the ends of the strip gathered in this manner are sewed up. Finally, set short pieces of wire covered with jaconet on the under side of the rim at regular intervals; each piece of wire extends from one outer wire of the rim to the other, and the crown and rim are overseamed together. The joining seam is covered by a Swiss muslin binding. 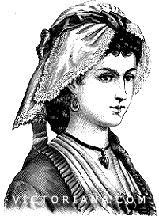 The hat is bordered with two ruches of figured jaconet an inch and a half wide, which are arranged in box-pleats half an inch wide; the ruche on the outside is hemmed on both sides a quarter of an inch wide, and the ruche on the inside is pinked very fine. 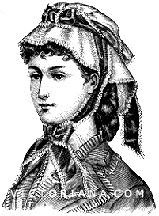 The crown of the hat is surrounded with a pleated band of figured jaconet, which is edged with lace, and the ends of which fall loose in the back. A bow of jaconet is set on in front. An elastic braid keeps the hat in place. Bend the hat thus finished in the shape shown by the illustration. This hood is made of fine white linen, trimmed with guipure insertion seven-eighths of an inch wide, white lace an inch and a quarter wide, and with blue silk ribbon. Fig. 3: Ecru Organdy Victorian Garden Hood. The trimming for this hood consists of ecru lace and brown reps ribbon edged with similar lace. Brown gros grain ribbon strings, trimmed with lace, tie under the chin.